CV Services offer better Value & Quality CV's. CV Services has consistently been voted top value and presentation CV writing in a comparison with many other CV writing companies. * We supply draft copies of your CV to review and check (draft CV will allow any amendments you require to be carried out). * No charge for same day urgent Cv preparation - all CV's are usually prepared same day! * CV drafts E-mailed (or posted) across to you as a proof prior to finalisation and printing. * Letter of applications compiled for specific job applications only - £9.99 - with CV. 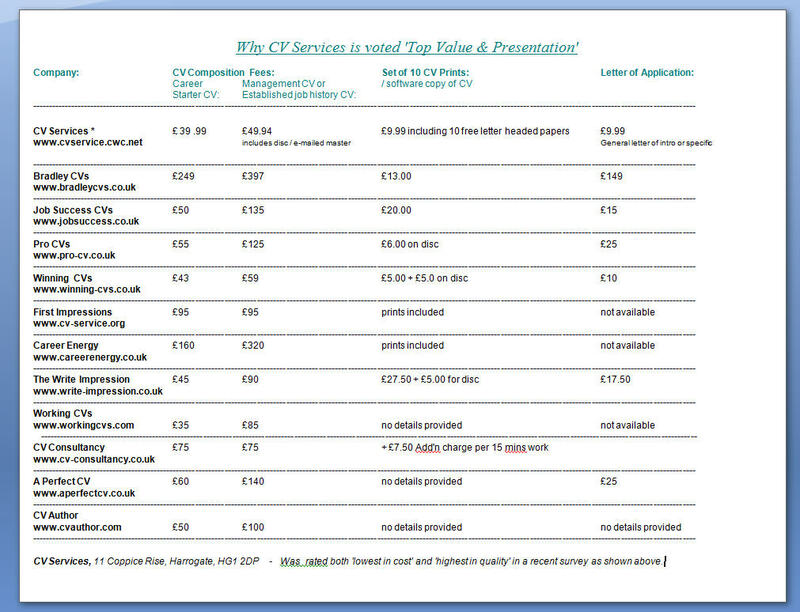 * MS Word version CV E-mailed to you / on CD RoM included in price - allows you to print .. or send your CV by E-mail.